As the long line of witnesses passing before the inquisition of Lord Justice Leveson showed clearly, there are some habits that the larger part of the Fourth estate find all too hard to kick. One of these is the inability to wait for real information before jumping to conclusions, and another is the antediluvian attitude to mental health issues. You thought the Sun’s Frank Bruno smear was history? Think again. 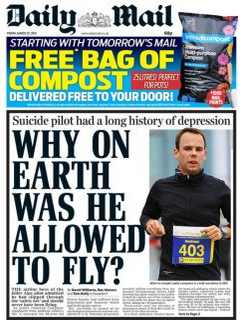 So when it came to analysing the crash in France of a Germanwings flight from Barcelona to Düsseldorf, which killed all 150 on board the Airbus A320, there was never going to be any restraint: the tabloids have to know NOW. And don’t come any of this “grey area” stuff. This was not helped by the ridiculous situation in France, where the crash happened, where air crash investigators are not given total control of investigating air crashes. As my good friend John Band has pointed out, this control is given over to the local “avocat”; it’s rather like the NTSB in the USA having to yield to the local District Attorney, a situation which would never be allowed to occur. And so enter Brice Robin, who has jumped to conclusions before even waiting for the Flight Data Recorder (FDR) to be recovered, relying only on the Cockpit Voice Recorder (CVR). From the CVR data he concluded that, while the Commander left the flight deck to use the toilet, the First Officer locked him out and put the A320 into a descent which ended up with it flying into the ground at the instantly deadly speed of around 600km/h. This is not an impossible scenario. But in the hands of the press, it is an incendiary one: the hunt was now on to find any flaw in the First Officer’s psychological profile. Yeah, stuff the partial evidence and the “avocat” jumping to conclusions, the press want you to know that, despite their massed ranks knowing little more than diddly squat about aviation, and less about air crash investigation, THEY KNOW WHO DONE IT. 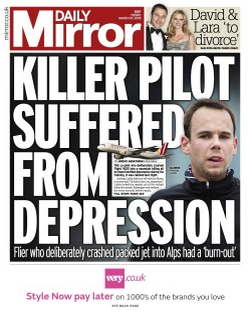 The Mirror knew that “KILLER PILOT SUFFERED FROM DEPRESSION”. 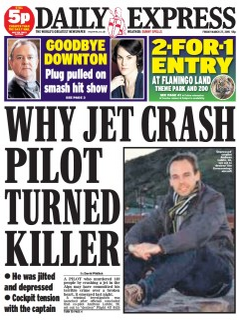 The Express told its readers “WHY JET CRASH PILOT TURNED KILLER”. And all the while, the hacks and their editors, instead of stopping and thinking, are trampling all over any scant understanding of mental health issues that had been slowly and painstakingly built up over recent years. What we need right now is a media that takes a proportionate approach to those issues, together with investigators who have sufficient decency and common sense to wait until they get the FDR analysed. This week we got neither, so are reminded that the French take the wrong approach to air crash investigations, and our free and fearless tabloid press is a disgrace. No change there, then. at least they've killed off the speculation that he might have been a scary Muslim. 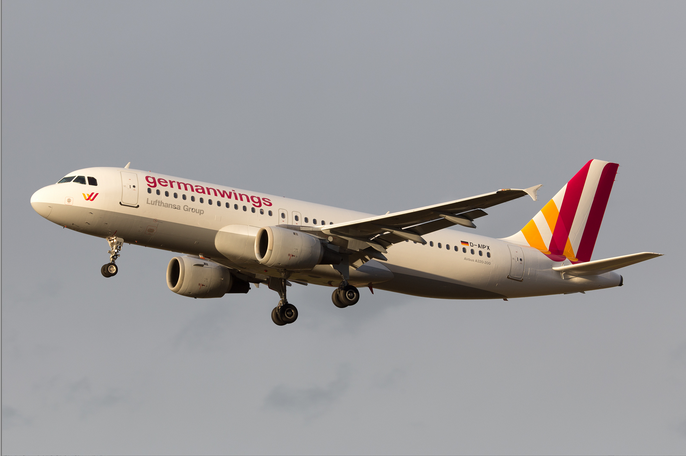 Scaling back the depression angle, it comes as no surprise to me that junior pilots at Germanwings were less than happy and that there were tensions with senior pilots. Since Lufthansa took over the name and used it to cut back costs the company has been in a state of near anarchy, with various strikes and disputes going on for a few years. New staff have considerably worse conditions than what may have been expected whilst more senior people transferred in on original Lufthansa conditions seem to be stuck in the middle of the battle. Doesn't make for a happy workplace at the best of times so if the man did have problems things weren't likely to get any better. And despite the cuts, passengers don't seem to be geting better value (or are they just milking the flights I look at?). So what do you do when your company is in crisis and has quickly achieved a less than rosy reputation? Well obviously you rename it! By the time the French have got round to finishing their investigation the company will be flying as Eurowings. 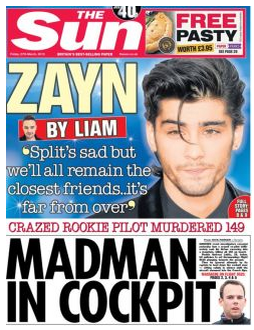 at least they've killed off the speculation that he might have been a scary Muslim."